Anchovy is any member of the more than 100 species of small, largely marine, herring-like fish comprising the family Engraulidae. Most are characterized by a large mouth, with the upper jaw extending well behind the eye and the jaw articulation well behind the eye, as well as a long, pig-like snout extending beyond the tip of the lower jaw (Nelson 1994). Anchovies are found in scattered areas throughout the world's oceans, as well as some freshwater and brackish water habitats, but are concentrated in temperate waters, and are rare or absent in very cold or very warm seas. Of the 139 species in 16 genera recognized by Nelson (1994), only 17 are freshwater species, occasionally entering brackish water, while the others are marine, rarely entering freshwater. Anchovies provide important ecological, commercial, and culinary values. Some species of anchovies, especially the European and Mediterranean fish Engraulis encrasicholus and other Engraulis species, are commercially important, being used in various appetizers, sauces, and dishes. As a group, anchovies are an important part of marine food chains, as well as some freshwater food chains, serving as a good food source for predatory fish, as well as marine mammals and birds. Some there is some danger of commercial interests leading to their being overfished and thus disrupting the delicate balance in marine ecosystems. Most species of anchovy are small. Most are under 20 centimeters in length, but Thryssa scratchleyi, which inhabits rivers in Papau New Guinea and the Gulf of Carpentaria, reaches 37 centimeters (Nelson 1994). Anchovies resemble herrings and silversides, but tend to have a larger mouth. In most species of anchovies, the hind tip of the maxilla (upper jaw) extends well behind the eye, as does the jaw articulation (Nelson 1994). The body is often translucent and some have a silver stripe down the side (Nelson 1994). Some appear as a small green fish with blue reflections due to the silver longitudinal stripe that runs from the base of the caudal fin. In members of the family, the lower limb of the first arch has ten to 50 gill rakers, while the genus Anchovia has 90 or more (Nelson 1994). Most species of anchovy have a pig like snout that projects beyond the tip of the lower jaw (Nelson 1994). Most species of anchovy feed on plankton, including some by filter-feeding, but some larger species each fish (Nelson 1994). Anchovies generally are very accepting of a wide range of temperatures and salinity. Large schools can be found in shallow, brackish areas with muddy bottoms, as in estuaries and bays. Most freshwater species are found in South America (Nelson 1994). Anchovies are an important part of marine food chains, as well as some freshwater food chains. It is a good food source for almost every predatory fish in its environment, including the California halibut, rock fish, yellowtail, sharks, chinook, and coho salmon (PSMFC 1996). The anchovy also is extremely important to marine mammals and birds. For example, there is a strong correlation between anchovy abundance and the breeding success of California brown pelicans and elegant terns (PSMFC 1996). Some species of anchovies, particularly Engraulis encrasicholus of Europe and the Mediterranean, are eaten by humans. They are a small oily fish that typically are filleted, semi-preserved with ten to 12 percent salt, and sometimes benzoic acid, and canned in oil (Herbst 2001; Bender and Bender 2005). Canned anchovies can last at least a year at room temperatures, and once opened can be refrigerated for at least two months if sealed airtight, covered with oil (Herbst 2001). Anchovies are both popular and infamous for their strong flavor. In Roman times, they were the base for the fermented fish sauce called garum that was a staple of cuisine and an item of long-distance commerce produced in industrial quantities. Today, they are a key ingredient in Caesar salad and Spaghetti alla Puttanesca, and are occasionally used as a pizza topping. Because of the strong flavor they are also an ingredient in several sauces, including Worcestershire sauce and many fish sauces, and in some versions of Café de Paris butter. Anchovies are most commonly marketed in small tins, either as "flat" fillets, or as "rolled anchovies" where each fillet is rolled around a caper. While both are quite salty, the flat fillets tend to be more so. They are also marketed in jars and tubes as a paste, mostly for use in making sauces, such as anchovy essence. The strong taste that people associate with anchovies is due to the curing process. Fresh anchovies, known in Italy as alici, have a much softer and gentler flavor. In English-speaking countries, alici are sometimes called "white anchovies," and are often served in a weak vinegar marinade. This particular preservation method is associated with the coastal town of Collioure in south east France. The white fillets (a little like marinated herrings) are sold in heavy salt, or the more popular garlic or tomato oil and vinegar marinade packs. The European anchovy, Engraulis encrasicolus, is the anchovy of commerce. Morocco now leads the world in canned anchovies. The anchovy industry along the coast of Cantabria now dwarfs the traditional Catalan salters, though the industry was only initiated in Cantabria by Sicilian salters in the mid-nineteenth century. Setipinna taty or ikan bilis is the anchovy commonly used in South-East Asian cooking to make fish stock or sambals. Anchovy is also used to produce budu, by fermentation process. In Vietnam, anchovy is the main ingredient to make fish sauce—nước mắm—the unofficial national sauce of Vietnam. Anchovies can concentrate domoic acid, which causes amnesic shellfish poisoning. 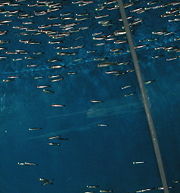 Fishermen also use anchovies as bait for larger fish such as tuna and sea bass. Agbayani, E. Family Engraulidae: Anchovies Fishbase, 2004. Retrieved October 3, 2007. Pacific States Marine Fisheries Commission (PSMFC). Northern anchovy. PSMFC, 1996. Retrieved October 3, 2007. This page was last modified on 2 April 2008, at 02:12.